In recent days, Manchester United announced a £750 million kit sponsorship deal with Adidas, the largest of its kind in world football, which will come in to force in the 2015/16 season. They take over from perennial rivals Nike, and this latest move adds another chapter to their long competition with each other, which was also illustrated at the recently concluded World Cup. But what does our BrandIndex data tell us about the two brands? Firstly, if we look at our Buzz Metric, which tells us whether a respondent has heard anything positive or negative about a brand in the last two weeks, we find that the two brands are fairly closely matched, as one may imagine. 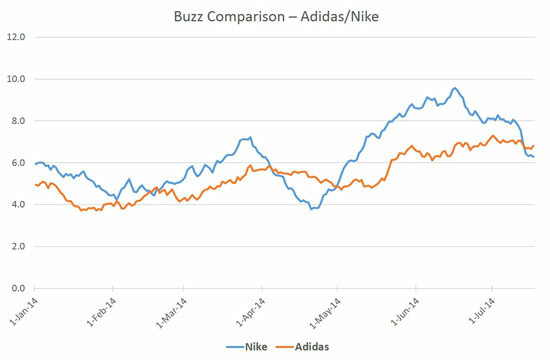 If we take the average scores from the 1st January, we see Nike on 6.3 points compared to Adidas’ 5.3. 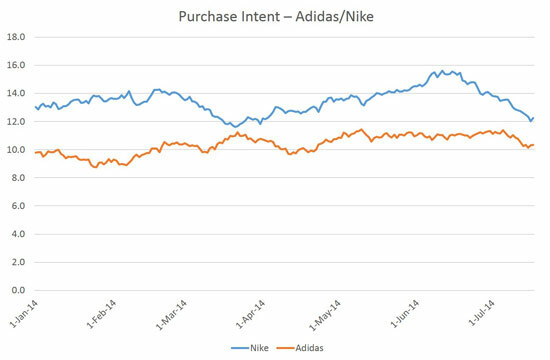 If we look a little more recently, from the 1st of May, when excitement around the tournament began to increase, Nike’s average is 7.9, to 6.2 of Adidas. 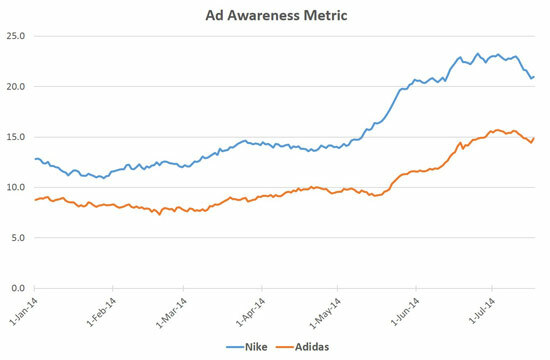 While Adidas may have had two teams in the World Cup final wearing their strips, YouGov’s Ad Awareness metric suggests that Nike may have had the more successful tournament campaign wise. Both brands launched high profile ad campaigns. Nike created their ‘Risk Everything’ strategy, involving crafted animated avatars of high-profile players such as Cristiano Ronaldo and Neymar Jr. Comparatively, Adidas unveiled their ‘All in, or nothing’ efforts, involving Zinedine Zidane and David Beckham, as well as Argentinian superstar Lionel Messi. If we consider the data, we can see that both brands experience an uplift in awareness, which you would expect surrounding an event with such large viewing figures and build up. However, Nike does show a higher rating. From the 1st of June (two weeks before the tournament), until now, Nike has an average rating of 21.9, with their score peaking at 23.0 over this time. Conversely, Adidas has an average of 14.0, with a high of 15.6. So what does this mean in terms of pound signs? How much of this increased ad awareness will lead to increased money in the tills? This is where we consider our Purchase Intent metric. Here again, we see Nike having an advantage. If we look at the period from the 1st June, we see that Nike has an average rating of 21.9, whereas Adidas is behind on 14.0. The battle between the two brands that dominate the sector is sure to rage on and on. The impact of commercial deals such as the one Adidas has struck will be evaluated in the ensuing months and years.